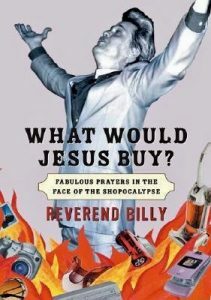 What hymn of discipleship challenges consumerism? Cecil Frances Humphreys Alexander (1818-1895) was born in Dublin one April day 200 years ago. As a child, she didn’t hide her light under a bushel, but she did hide her poems under a carpet, literally. Her father was stern, strict, and very rich. One day, he discovered his daughter’s secret writings. 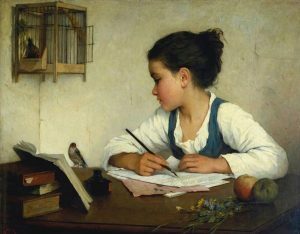 The family expected him to punish the wee lass, but instead he gave her a pretty box in which to keep her scribblings and invited her to read them aloud to the family every Saturday evening. With this encouragement, the young poet was off and running. As a young woman, she wrote verses to enhance the Bible lessons she taught her Sunday school students at the Anglican Church. In 1850, she married Rev. William Alexander, an Anglican clergyman. At first they were sent to minister to rural churches where she embraced new responsibilities for maintaining a home and garden. She never became a mother, but continued to write poems for children throughout her life. As her husband climbed the ranks of his profession, first as Church of Ireland Bishop of Londonderry, then as Archbishop of Armagh and Primate of All Ireland, she accompanied him to meetings in high society and often hosted dignitaries. Perhaps she was thinking of the contradictions inherent in being a comfortable Christian when she penned the verses to “JESUS CALLS US” one autumn evening in 1852. Her husband had spent the day writing his sermon for Saint Andrew’s Sunday. Over dinner they discussed the scripture Matthew 4: 18-20, in which Jesus called out “Follow me!” to two brothers fishing in the Sea of Galilee. 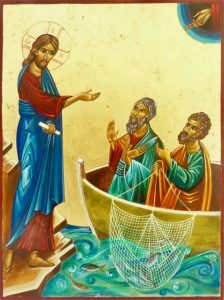 At once, Andrew (the “First-Called”) and Simon Peter (the “Rock”) dropped their nets and followed Jesus. Inspired by this conversation, Mrs. Alexander wrote this hymn of discipleship. It was read to the congregation that Sunday following the sermon. 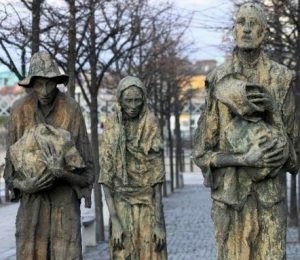 In the 1850’s, Ireland was recovering from a period of mass starvation caused by the potato famines of 1845-1849. Over a million people had died, Another million had fled the country. Mrs. Alexander made frequent visits to those who were still struggling to survive. She traveled the soggy moorlands, bringing food, clothing, and medical supplies to farm families. Once, she went every day for six weeks to tend a woman’s infected foot. She also gave away the money she made from her hymn and poetry collections, once to fund a school for deaf children, another time to the Derry Home for Fallen Women. As she wrote the words to “Jesus Calls Us,” she remembered the apostles who were asked to leave everything behind — work, home, family. Her Christ pleads, “Christian, love me more than these!” Startled, we realize that the hymn is in present tense. Jesus calls us. Us? Yes! We are the ones called from our obsession with “the vain world’s golden store.” Jesus is motioning to us, calling us to follow him, demanding, “Christian, love me more!” We hear his plea, “Love me more than these!” whether we’re at work or taking our ease with our feet up. But are we ready? Isn’t this a little extreme? Can we be honest? 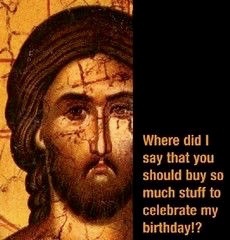 Prophets through the ages have warned about greed and consumerism. Some have rejected comfort entirely, though the ability to make such a choice ironically separates the privileged from the powerless poor. Saint Francis famously shunned his family’s wealth and danced with “Lady Poverty.” Gandhi, a British-educated lawyer from a middle class family, sought to be one with India’s poor and reduced his earthly possessions to sandals, a few books, reading glasses, and a loin cloth. At a time when healthcare benefits and food stamps in the U.S. are being cut for those in need and the gap is widening between the rich and the rest of us, it’s useful to consider what the Bible says about greed and wealth. There are too many verses to list here. My personal favorite from the Hebrew scriptures is Habakkuk 2: 5, “Wealth is deceitful. Greedy people are proud and restless; like death itself they are never satisfied.” Whoa! Early in her career Cecil Frances Alexander penned a verse for “All Things Bright and Beautiful” that suggested God endorses human class divisions: “God made them, high or lowly, / And ordered their estate.” That verse is no longer included in most hymnals. Did she mature out of this misguided belief? We can’t be sure. All we know is that she lived as one who was intimately aware of the suffering poor and was welcomed into their homes. 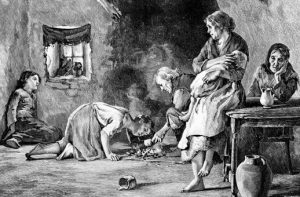 One contemporary, Louis F. Benson, wrote of her, “She was as much at home in the back streets of Londonderry as in the Bishop’s Palace.” It is said that on the day of her funeral the streets filled with mourners — destitute, wealthy, Irish, English. Cecil Frances Alexander had touched their lives with her actions and with the words of her 400 poems and hymns.